To make the herb pesto, preheat oven to 180°C/350°F/Gas Mark 4. Spread pine nuts over a baking tray. Cook in a preheated oven for 7-10 minutes or until golden. Transfer to a plate and set aside to cool. Place the pine nuts, coriander, the parmesan and garlic in a food processor and process until finely chopped. Gradually add oil in a thin, steady stream until well combined. To serve, combine the herb pesto and the mayonnaise in a small serving bowl. 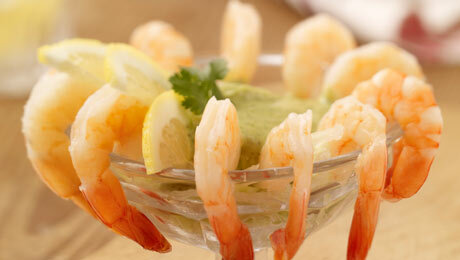 In large glasses place the prawns with the lemon slices and then drizzle with the herb pesto mayonnaise.